Please be advised that our reservations hours of operation are changing due to the holiday. Don’t forget you can use Crystal's online booking engine, CruiseBuilder, during this time to review all aspects of your booking. Crystal Cruises is pleased to announce our 2012 World Cruise is open for sale! Fares for the Epic Islands & Empires are now available online along with full World Cruise segment itinerary details, savings and amenities. The 17th annual World Cruise aboard Crystal Serenity departs January 18-April 21, round-trip Los Angeles, spanning five segments ranging from 16 to 22 days in length. Visit 35 ports via the South Pacific, Australia and New Zealand, Asia, Alaska and Canada. 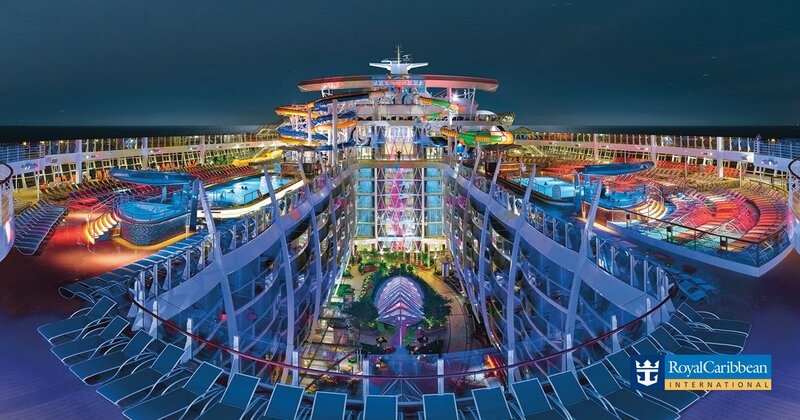 Plus, enjoy 2-for-1 World Cruise Fares, Free Air on all segments, up to $8,000 per couple ($4,000 per person) “All-Inclusive. As You Wish.” CruiseBank spending credits and more. All guests paying in full 180 days prior to departure receive 2.5% additional Early Full Payment savings off special 2-for-1 Fares. Book your clients by February 28, 2011 on convenient 12-day round-trip San Francisco voyages 1211-1213 and they'll enjoy exclusive Penthouse & Verandah savings of up to $2,000 per couple! Crystal’s returning to majestic Alaska for the first time since 2005 with nine cruises, eight of which will visit Glacier Bay National Park. Your clients will marvel at snow-capped mountains, deep fjords and a stunning amphitheater of glaciers and granite peaks. Plus, they’ll receive 2-for-1 fares, $500 per person “All-Inclusive. As You Wish.” spending credits, FREE air and our Penthouse & Verandah savings! Just announced! Our 2011 Penthouse & Verandah savings offer now includes Mediterranean voyage 1320. Book your clients by December 31, 2010 to enjoy savings of up to $3,000 per couple! This limited-time offer is available on a diverse collection of 2011 itineraries. From the sultry rhythms of South America to the treasures of the Mediterranean, your clients will enjoy up to $3,000 per couple in Penthouse & Verandah savings, plus up to $2,000 per couple in “All-Inclusive. As You Wish.” spending credits and Free Air! Crystal Cruises is pleased to announce our all-new Online Training Program, Crystal Cruises: A Perfect Choice is now available. Once you complete the comprehensive A Perfect Choice course, you will not only have a greater understanding of the World’s Best cruise line and be certified as a Crystal Cruises Expert Travel Agent, but also become eligible for consideration in our free FAM cruise program, earn CLIA credits toward ACC and MCC accreditation, CEU credits from the Travel Agent Institute, receive a Crystal Sales kit and much more. Register today at crystalcruises.com/agent to learn how to increase your Crystal sales today, and be sure to look for upcoming announcements regarding future course modules. Crystal Cruises is pleased to announce that our 2012 day-by-day itineraries are now available for priority waitlist! Our 2012 season features 59 itineraries visiting 183 ports in 66 countries. Award-winning Crystal Symphony and Crystal Serenity boast a range of cruises that explore world-renowned destinations including Europe, New England and Canada, Asia, South America, the Middle East and South Pacific. Included in 2012 are six voyages of 17 days or more, 40 voyages ranging from 11-16 days and 13 voyages that are 10 days or less. Your clients may enjoy 91 overnight calls in Rio de Janeiro (during Carnival on voyages 2204 and 2205), Buenos Aires, Barcelona, Istanbul, Honfleur (with an optional excursion to Paris), Ashdod, Alexandria/Cairo, Sydney, Osaka and other exciting worldwide cities. Plus, double overnight calls in St. Petersburg, Sydney, Ho Chi Minh City and Beijing. Plus we have 19 maiden calls to Beirut, Lebenon; Tartus, Syria; three in New England & Canada; five in Brazil and more! For a complete day-by-day listing of our 2012 voyages please visit crystalcruises.com. It's not too late to book your clients aboard the Holiday vacation of their dreams. Choose from two festive, tropical holiday voyages and your clients will receive $1,000 per couple in “All-Inclusive. As You Wish.” spending credits, kids sail free and more! Plus, with our Crystal Family Memories Program, for every 6 guests who sail together, Crystal offers your clients pre-paid gratuities, a $500 credit toward a Crystal Private Adventure®, free berths for kids 17 and under, and more. Or, sail with 10 guests and receive all the above perks, plus one additional free berth. Kids Sail Free on three 2011 Pacific Coast voyages! Your clients will enjoy convenient, close-to-home 7-day Pacific Coast voyages. Explore Santa Barbara's Mediterranean-style scenery and sail under the famed Golden Gate Bridge. Take advantage of incredible value including complimentary $500 per person in “All-Inclusive. As You Wish.” spending credits, and free air as well as our new offer, Kids Sail Free! Enhance your client’s journey to Europe with Crystal’s new low-cost Business Class air upgrades for just $999 one way from select gateways available in 2011 on voyages 1309-1317. And now with the stronger U.S. dollar, there has never been a better time to enjoy all Europe has to offer. Don’t miss this opportunity to make your client's vacation dreams come true with added comfort and luxury aboard the World's Best. Crystal Cruises is pleased to offer your clients a chance to experience the beauty of the Taj Mahal, India’s most famous UNESCO World Heritage Site! This once-in-a-lifetime event is a 3-night/4-day pre-cruise package that begins on March 26, at the beginning of Grand Exotic Voyage 1307 (which departs March 29 from Mumbai to Cape Town). At the end of this pre-cruise program your clients will be transferred from Delhi to Mumbai where they’ll join Crystal Serenity to continue their journey to Cape Town. Pricing for this tremendous package starts at $599 per person based on double occupancy ($999 single occupancy). Call us today! Our Sell Three/Sail Free promotion is now available on 2011 voyages! Sell three staterooms (booked on or after July 12, 2010) on any 2011 voyage and you and a guest sail free on a choice of select 2011 voyages. Crystal's "Bonus Share the Experience” program for 2010 and 2011! This program is available to all guests! All of your Crystal clients can be rewarded up to $400 in shipboard spending credit for sharing the "Crystal Experience" with up to 4 (per year/per person) new-to-Crystal guests who booked after July 7th. Please see the 2010 and 2011 eligible voyages below, plus each sponsored new-to-Crystal guest will be rewarded with $100 shipboard spending credit! Free Business Class or Economy air is offered on ALL 2011 voyages! Slip into the blissful routine of simple luxury aboard a 7- to 10-day Crystal cruise. Enjoy 2-for-1 fares, up to $2,000 per couple ($1,000 per person) in “All-Inclusive. As You Wish.” spending credits, price guarantee, and free air on select voyages. "All-Inclusive" shouldn't mean limited options. That's why Crystal is giving your clients up to $2,000 per couple in shipboard spending credits to spend in any way they wish available on ALL 2010 and 2011 sailings. From spa treatments to fine wine, a Crystal Adventures shore excursion to something special from our boutiques. Even gratuities for their favorite Crystal staff member, and more. The choices - all of them - are exclusively theirs, as they wish. Sail with 6 full-fare, full payment family and friends on Crystal Family Memories Sailings and receive pre-paid gratuities; $100 per person shipboard credit (maximum 2 per stateroom); free 3rd berths (17 and under with waiver); one 8x10 group of their choice from the cruise, one set per stateroom; and $500 credit toward a minimum $2,500 Private Adventure. Or sail with 10 full-fare, full-payment guests, enjoy all of the amenities mentioned above, plus 1-free berth. Available on ALL 2010 and 2011 voyages. 2-for-1 Fares are per person based on 50% of the Brochure Fares (note: Brochure Fares, in effect as of 9/21/09, may not have resulted in actual sales). All fares listed on this Promotion Summary are per person based on double occupancy in U.S. dollars cruise only for category E on Crystal Symphony and category C on Crystal Serenity and do not include port charges which vary by departure. Free air promotion applies to select 2010 sailings and all 2011 sailings; free Business Class air promotion applies to Trans-Atlantic flight only and both promotions are available from select gateways, routes and carriers. $2,000 per couple “All-Inclusive. As You Wish.” shipboard spending credit is the maximum credit available, is non-transferable, cannot be used in the casino, for bingo, redeemed for cash or credit and cannot be applied as a deposit toward a future cruise. Fuel surcharges may be added at anytime to defray fuel cost increases, even if the fare has been paid in full. All offers may not be combinable with other promotions, apply to first two full-fare guests in stateroom or suite, are capacity-controlled, subject to availability and may be withdrawn or changed at any time without notice. All itineraries, fares, programs and policies are subject to change. For complete details, terms and conditions for the offers listed above, click on the link for each offer. Ships' Registry: The Bahamas.